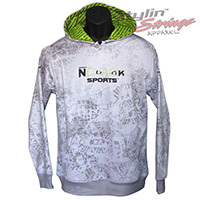 We have designed custom hoodies for the Spooky Nook, the biggest indoor sports complex in the nation. 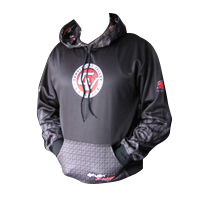 Our edgy style & quality products have set the bar for custom sweatshirts. You can choose to go with a zipper up or pullover. Raglan or Set-in sleeves can be applied to Men’s or Women’s cuts. 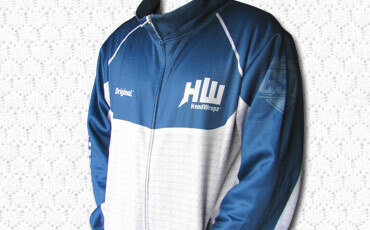 We created our own custom fitted template from top to bottom for the track jackets. 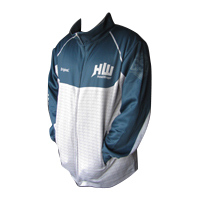 All styles can work for any sport, team, organization or field house spirit wear. The raglan cut has a seam that arc’s from the armpit to the neckline of the hood. Similar to shooting shirts, we choose the best cut based on the design we are going to use, or what logo is supplied. 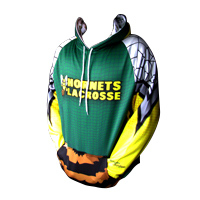 The inside of the hood is also customized. The fabric is soft on the inside and outside making these a great team item. Set-In sleeves are squared off at the shoulder line. These allow for more surface area when the graphics need it. This is a great item to throw in a team store or to get the family involved in supporting the squad. The inside of the hood is designed custom, which is a nice addition to the overall design. It wears and feels like a high-end garment with a soft feel on both sides. Our track jacket was built completely custom. 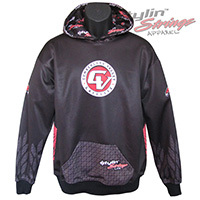 We started with a hoodie template until we dialed it in to a sweet garment. 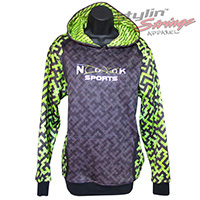 The dye sublimated collar and cuffs give it a cool look. It is soft on the inside, and sizing is dialed in after over a year of testing. Only thing different then the HeadWrapz sample on the left is the front pockets are now at the bottom hem to the inside zipper. The women’s hoodie has a more feminine cut in the mid-section. We also dialed in the shoulders and sleeve length with numerous test pieces. 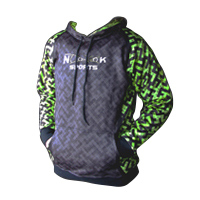 We can do this in a raglan as shown in the Spooky Nook sample, or with set-in sleeves. Print the inside of the hood too for added coolness. Although we do not have a picture yet, it is the same as any of our hoodie cuts above, it just has a zipper down the middle and the pouch becomes pockets. Easy to throw on and off this is one of our favorites, new sample picture coming soon.